Late 18th century map of Denmark. Le Danemark divise par Provinces et Dioceses sous une Metropole. 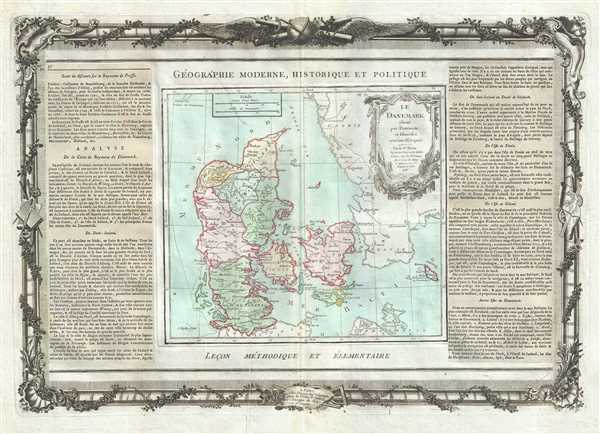 This is a beautiful 1786 map of Denmark by French cartographer Louis Brion de la Tour. It covers all of Jutland and the Island of Zealand, Funen and Lolland. Renders the entire region in extraordinary detail offering both topographical and political information. Denmark prospered greatly in the last decades of the 18th century because its neutral status allowed it to trade with both sides in the many contemporary wars. In the Napoleonic Wars, Denmark originally tried to pursue a policy of neutrality to continue the lucrative trade with both France and Great Britain and joined the League of Armed Neutrality with Russia, Sweden and Prussia. A beautifully engraved title cartouche adorns the top right quadrant of the map. To the left and right of the map are paste downs of French text with remarks and description of the map. Surrounding the whole is an elaborate decorative border featuring floral arrangements, surveying tools, elaborate baroque scalloping, and a winged globe. This map was issued as plate no. 37 in the most deluxe edition of Desnos’ 1786 Atlas General Methodique et Elementaire, Pour l’Etude de la Geographie et de l’Histoire Moderne.